Anonymous marcher on November 5, 2016. Photo by Tom Hilton, courtesy of Creative Commons. What Is Anonymous Up To? Every year, November 5 brings the Internet’s Anonymous movement into the streets worldwide for the Million Mask March. After all, the date marks Guy Fawkes Day, named for a would-be assassin who tried to blow up the British Parliament in the early 17th century. 2017 promises another round of celebration and disobedience—an opportunity to consider what the “information wants to be free” hacktivists and their allies have been up to lately and where they might head next. But dormancy may precede growth, and plenty of seeds require attention. In February 2016, Anonymous leaked a database from the French Ministry of Defense to protest the weapons trade. The next month, Anónymous México knocked the website of that country’s tax bureau offline temporarily for the sake of the disappeared Ayotzinapa students. Most shockingly, shortly after Trump’s inauguration, Anonymous’ #OpDeathEaters campaign released a compilation of public data tying the president to Russia’s regime and child traffickers. Any of these examples could be cultivated into further resistance should individuals take initiative—and new tools might better equip them to do so. To invigorate activism, two long-time friends of Anonymous, Barrett Brown and writer/programmer Heather Marsh, recently founded ambitious software projects, each aimed at reshaping online interactions. Their logic, formulated independently, starts simple: since the Internet gave the movement its strength, upgrading the Internet (or how we use it) should upgrade activism. What makes restructuring communication so powerful? Now and then the workers are victorious [against the bourgeois], but only for a time. The real fruit of their battles lies, not in the immediate result, but in the ever expanding union of the workers. This union is helped on by the improved means of communication that are created by modern industry, and that place the workers of different localities in contact with one another. It was just this contact that was needed to centralise the numerous local struggles, all of the same character, into one national struggle between classes. But every class struggle is a political struggle. And that union, to attain which the burghers of the Middle Ages, with their miserable highways, required centuries, the modern proletarian, thanks to railways, achieve in a few years. In short, Marx and Engels said new technology linked, and thereby strengthened, previously isolated proletarians in their fight against capitalists. By uniting, striking, and rebelling internationally, paid workers (the communists championed them at the expense of the unemployed and unemployable) could advance their shared interests against transnational opponents more effectively than if they cooperated with only those in their immediate vicinity. Today, when the messages, transactions, and externalities of so many cross borders daily, limiting focus to just what affects one’s own region counterproductively complies with the leaders who impose the invisible boundaries that divide humanity in the first place. As state and non-state actors alike sway populations around the planet, activists who can’t manage the same trick are too often left merely handing out pamphlets on streetcorners or their virtual equivalents. The most important fact of the 21st century is that any individual on the planet can now communicate with any other individual on the planet. The great preponderance of human activity is the result of communication between two or more individuals. A great amount of human activity, both devastating and wondrous, has already occurred in a past defined by great limitations on communication between individuals. The Internet came to public availability in the mid-’90s and has improved drastically as a means of communication in only 15 years’ time. Some people will find these facts to be of crucial importance and will act on them. This is an important thing to keep in mind. Though Brown’s “most important fact” is premature—half of Earth’s humans remain offline—his suggestion that the Internet presently forms the pivotal arena continues to ring true. In 2011, reports emerged showing the Pentagon was developing fake cyberspace personas to spread pro-US propaganda; currently, perhaps partly thanks to Brown’s prescient work, frustration with astroturfing, automated social media accounts, and the like drowning out authentic digital discourse is exiting the realm of “conspiracy theory” and entering the mainstream. But since the authorities’ resources vastly outstrip those of activists, the playing field stays tilted: Is amplifying celebrities’ status quo opinions the sole, impotent option when vying with the powerful for hearts and minds? The accelerated pace and power of global communication strains and bursts the old systems of control. People can walk en masse across borders, shun the current financial system, establish our own trade, create transparency and provide emergency assistance to each other. This power to dismantle the structures we have relied on is terrifying to many because there is no clear path ahead, and few structures have yet formed to replace the ones that are crumbling. The growth of extreme nationalists and traditionalists worldwide, the buildup of militaries and intelligence monitoring are indicative of this fear of our unknown future. Old authoritarian systems can no longer bind the natural chaos of a free society, but we can show the power of chaotic order, the beauty and creativity of collaborative freedom, if we build the right structures now. With the heady objectives in mind, consider the specifics of Brown and Marsh’s separate proposals. Despite the buzz of a recent Brown manifesto, the few details so far available articulating the workings of his Pursuance Project software describe fairly mundane project management technology. Users create “pursuances”—a neologism he defines as “a process-based civic entity consisting of a series of agreed-upon relationships.” These will be customizable electronic organizations, wherein users experiment with different flowcharts for sharing documents and assigning tasks. Meet the new boss, same as the old boss. The Pursuance Project offers all the right things to seize spotlight in the hacktivism/transparency milieu—pledges to supply gee-whiz encryption, famous faces bedecking the board of directors, a November 4 hackathon appearance by Brown, et cetera—but one wonders who will actually complete the tasks of these glorified to-do lists and why. 200 people and groups chosen for a “track record of advancing individual rights, state accountability, and robust journalism and information dissemination” plus agreement with Brown, in broad terms, to “oppose the drug war, police state, and national security state” are to populate the ecosystem of pursuances first. The 200 seeds would then invite others in as varied alliances and flowcharts are tested and copied. Creators of pursuances command control over them from the beginning, and might share degrees of power, but might also sit back while others dispatch tasks boosting the task-definers. If this sounds like another day at the office, readers may be right. Although one reason for online activism flagging has probably been the incarcerations of capable Anons, another culprit may well be the base’s exhaustion with hierarchy: since Occupy and WikiLeaks, the rank and file have possibly grown tired of contributing to the careers of luminaries rather than to sizable change (the two are unfortunately conflated), and for little to no return on their efforts. [W]e are governed by ponzi schemes of celebrity, wealth and power and in order to benefit from these ponzi schemes, we need to enable and support them. No one has ever become wealthy by being of assistance to someone trying to survive in the streets. No one has ever become a millionaire by raising a baby. If you want to acquire wealth, you need to be of service to the wealthy so they can distribute that wealth down to you. And in order to gain influence, you need to promote and agree with and amplify those with greater influence so they can raise you up. And just as crypto-currencies did nothing to change this algorithm online, social media did nothing to change the ponzi scheme of celebrity. All either of them did is reproduce the same algorithm with all of the physical barriers lifted, so we have the same ponzi schemes but now the results are instant […] We need algorithms which reward us for being of service to those who need it most and we have algorithms that reward us for being of service to those who need it least. To help those in need, online collaboration must be redesigned, Marsh argues. Currently, cooperation happens on untrustworthy and unreliable corporate platforms—for example, activists create Facebook event pages—ensuring Silicon Valley benefits from data-mining user behavior, something people enable because they don’t want to lose the content and relationships they’ve generated. Marsh argues a global data commons must be established to decouple the raw material of collaboration from particular software. While Pursuance Project users would have to both agree with Brown and depend on his software, Marsh envisions the fundamental units of digital collaboration (nodes for person, organization, event, thing, and idea) belonging to everyone like the ocean or ozone layer and compatible with any software that wants to add functionality. Users could accept or reject any particular software application without losing access to their work or the information commons. With the atoms of knowledge free for everyone to build with, people can reward whatever work they prefer, rather than the owners of knowledge resources dictating the carrots and sticks. 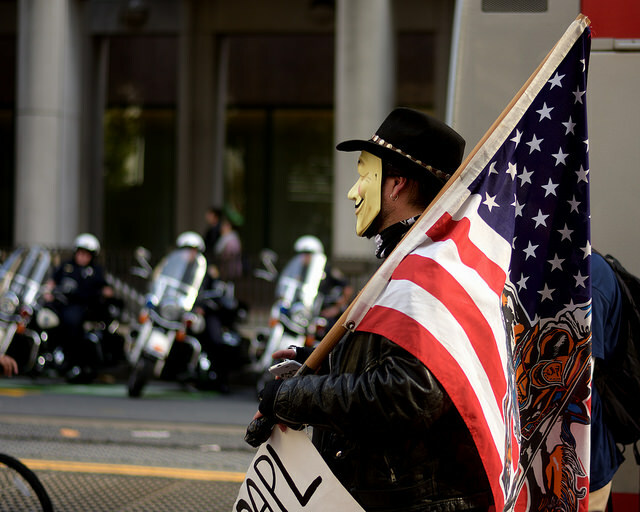 When thousands of Anons hit the streets November 5, which ideas will drive them? Speaking in Madrid last year Marsh called Anonymous a method of collaboration that follows information. For this information-led collaboration to continue and expand, information must remain under participants’ control. With corporate platforms like Facebook demanding pay-to-play for information producers and new initiatives like Pursuance Project retaining old hierarchical methods, the best ideas might get lost instead of being discovered and vetted by activists themselves. They need to think carefully about which global collaboration approaches deserve support.